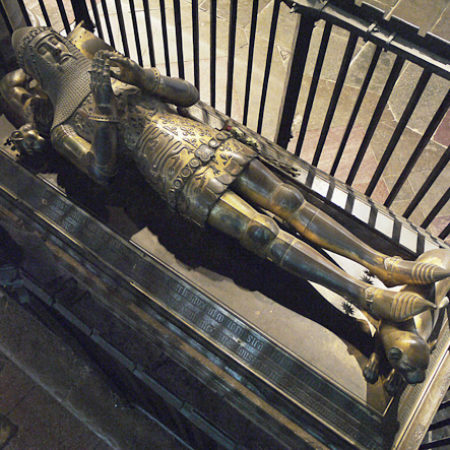 Perhaps the most prestigious type of tomb monument created in the medieval period was the gilt cast copper-alloy effigy. They were produced across Europe, from Germany, France and Denmark in the north to Italy, Spain and Portugal in the south. The majority of those recorded in England have been destroyed during periods of religious and civil turmoil, but a handful survive. 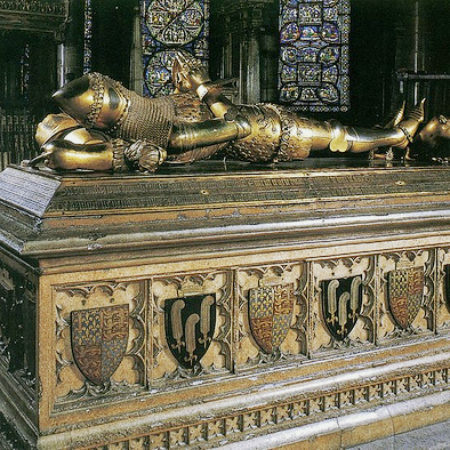 One such is the monument to Edward the Black Prince, in Canterbury Cathedral. The manner of the monument was specified by Edward in his will; he asked for ‘unymaged’overeignelevezde latounsuzorrezsoitmysen memorial de nous, tout armez de fier de guerre de nous armezquartillez et le viagemei’. 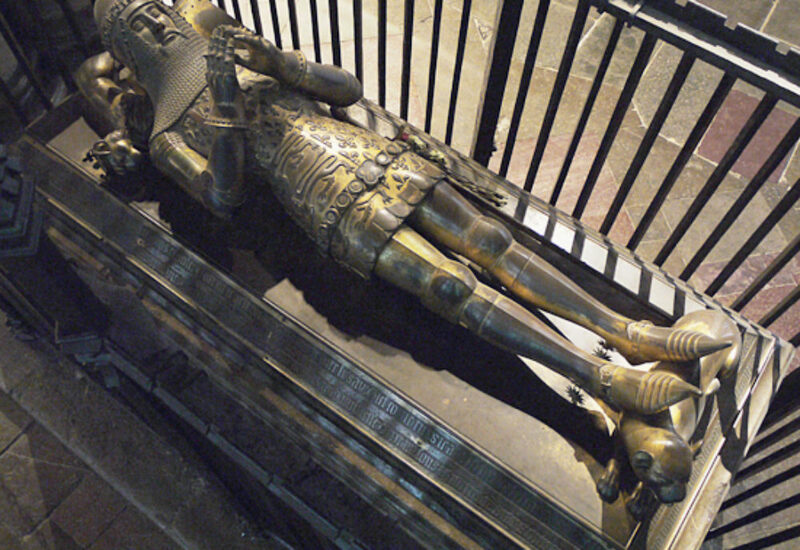 Although commissioned by his son Richard II, the effigy follows closely Edward’s specification. The beautifully executed and finely detailed cast copper-alloy effigy shows Edward as an adult crown-prince in armour. 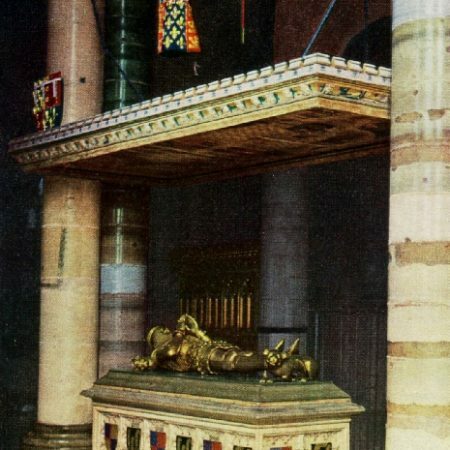 It compares with Edward III’s monument, also commissioned by Richard, in its cool restraint and is in marked contrast to the highly decorative monument that Richard later chose for himself. Edward is depicted recumbent with his head on his helm, hands in prayer and with his feet resting on a leopard. He wears a bascinet with aventail attached and plate body armour with a tightly-fitting heraldic coat armour over and an arse-girdle at his hips. 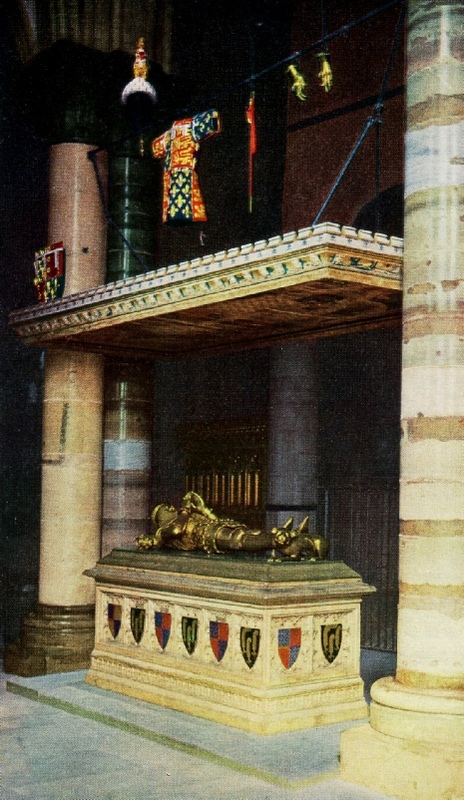 The effigy rests on a Purbeck marble tomb-chest beneath a tester depicting the Holy Trinity, with his heraldic achievements hung over the tester; the combination of the tester and the surrounding iron grille have fortunately guarded against casual theft. Who so thou be that passes by, where these corpse entombed lie: understand what I shall say as at this time speak I may. Such as thou art, so once was I, such as I am, such shalt thou be. I little thought on the hour of death so long as I enjoyed breath. Great riches here did I possess whereof I made great nobleness. I had gold, silver, wardrobes and great treasure, horses, houses, land. But now a poor caitiff am I, deep in the ground lo here I lie. My great beauty is all quite gone, my flesh is wasted to the bone. My house narrow and throng, nothing but truth comes from my tongue. And if you should see me this day, I do not think that you would say that I had never been a man, so altered now I am. For God’s sake pray to the heavenly king that he my soul to heaven would bring. All they that pray and make accord for me unto my God and Lord: God place them in his Paradise wherein no wretched caitiff lies. The contrast between these modest, almost Lollard-like, sentiments and the material splendour of the monument may seem curiously incongruous. There are no contracts for this tomb, which was probably made shortly after Prince Edward’s death in 1376. There is no documentary evidence naming the craftsmen involved, but Henry Yevele and John Orchard are regarded as the most likely candidates. 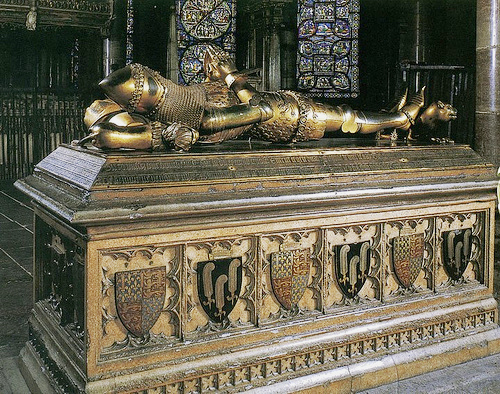 The Black Prince’s Purbeck-marble tomb chest is an example of the London version of the Perpendicular style and has been attributed to Henry Yevele, who was the leading exponent of that style in the late fourteenth century. 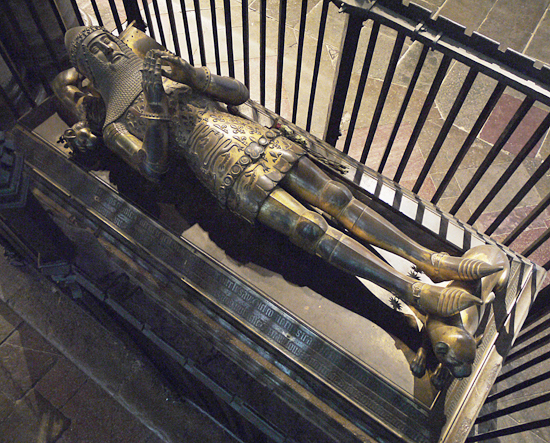 Contractual evidence demonstrates that he was involved in the production of Richard II’s tomb chest, while Orchard is a prime candidate for the copper-alloy elements of Richard II’s monument.